On your average restaurant beverage list, the inclusion of cider in the beer section is commonplace. It’s also misleading. While very much its own thing, cider is actually more akin to sparkling wine. 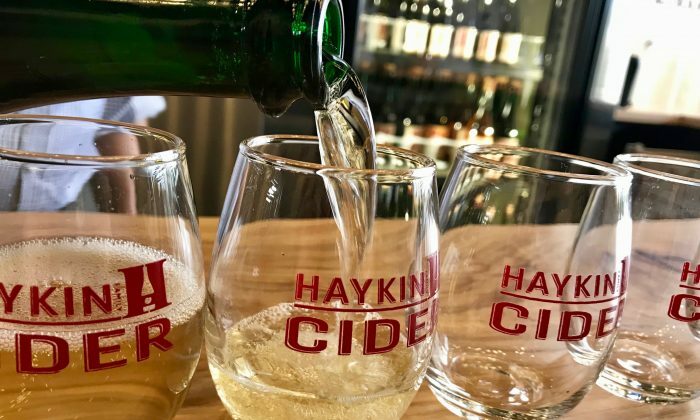 And thanks to producers such as Daniel and Talia Haykin of Haykin Family Cider in Aurora, Colorado, it’s getting closer all the time. The most obvious similarity is that cider is made from fruit, not grain. Indeed, Daniel says: “We think of it as wine first and foremost. Everything that applies to wine applies to cider”—including that the latter begins in the orchard, just as the former begins in the vineyard. If it’s therefore true that, “no winemaker, no matter how good, will ever make a wine that’s better than the grapes they’re using,” it’s also true that “the only way to make world-class cider is to use world-class fruit,” he added. That capped a series of revelations that Daniel had when he first began dabbling in cider production. And third, in working with their crops, he discovered just how much heirloom apples diverge in kind as well as quality: As with wine grapes, the difference between one variety and another is, well, apples and oranges. Thus did the Haykins set their sights on single-varietal ciders. It was a risk, Daniel admits. 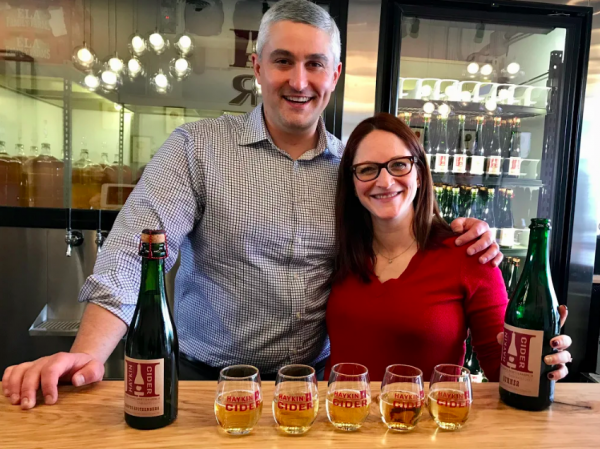 “The received wisdom from Europe is that to make a balanced cider, you have to have at least a few different varieties—one that brings aroma, one that brings tannin,” and so on, he said. Their winemaking counterparts, however, would surely disagree: After all, some of the best wines on the planet are monovarietal, including Barolo (Nebbiolo), Burgundy (Pinot Noir), and many of the Champagnes that the couple take as an inspiration. In any case, Daniel figured there was only one way to find out: “How do you know until you use a variety on its own? I’m trying to showcase all the flavors packed into one apple. Even if they’re not perfectly balanced, single-varietal ciders are inherently more interesting”—complete with the colorful backstory of the given heirloom species, of which there are thousands in the U.S.
That brings us to the concept of terroir, or the influence of place on a product, which Daniel believes to be as important a factor in cidermaking as in winemaking. “The same apple from two different growers makes for a radically different tasting experience,” he asserts. “And from two different regions? It might as well be a different apple.” Vintage matters too, of course—even the same variety from the same grower will change in character from harvest year to harvest year. Clearly, the law needs to catch up with the industry, and quickly. After all, Haykin isn’t the only cidery in the country experimenting with this stuff: To name just two others, there’s Gowan’s in Philo, California, and Black Diamond in Trumansburg, New York. “RiNo reminds me of Williamsburg in 2004—just pretentious enough to be good, not yet pretentious enough to be annoying.” Kevin Burke is joking, of course.